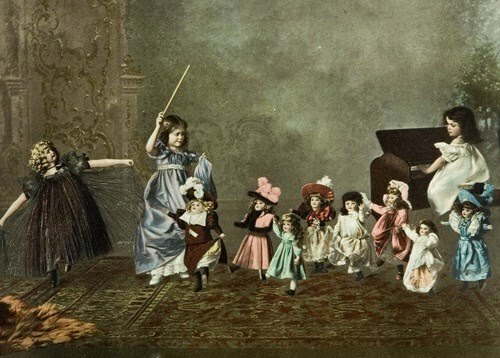 Dolls from the Attic...Mis Muñecas: The Queen is Dead...Long Live the King! The Queen is Dead...Long Live the King! As the procession receded into the distance across the shimmering silver of the sea, the sun, sinking to the horizon, broke into a still greater blaze of glory. 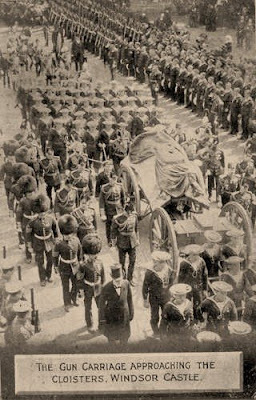 Far, far off, the pall upon the Royal coffin was still distinguishable, for the little Alberta as she passed between the towering battleships was still in the track of the sun. 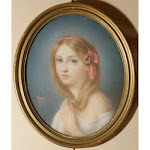 Above her the moon, almost full, showed faintly in the sky; and the air trembled with the notes of a funeral march, rising from some ship in the far distance. This marble bust of Queen Victoria (reigned 1837-1901) shows her dressed simply, although her royal status is indicated by the royal coat of arms on the front of the socle (base). 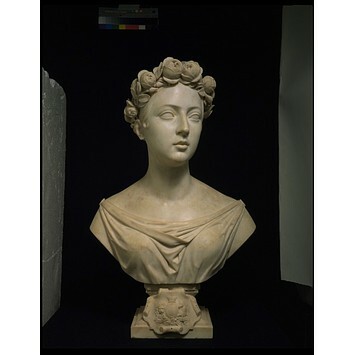 The bust was made six years after her accession to the throne by a German sculptor possibly known to her husband, Prince Albert (1819-1861). The exact circumstances for the commission are unknown. 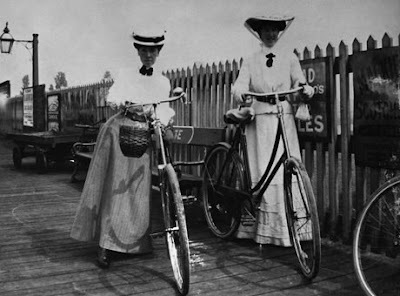 By the end of 1900, Queen Victoria's health had notoriously declined. She was almost blind and was too weak. By mid-January the end was imminent. 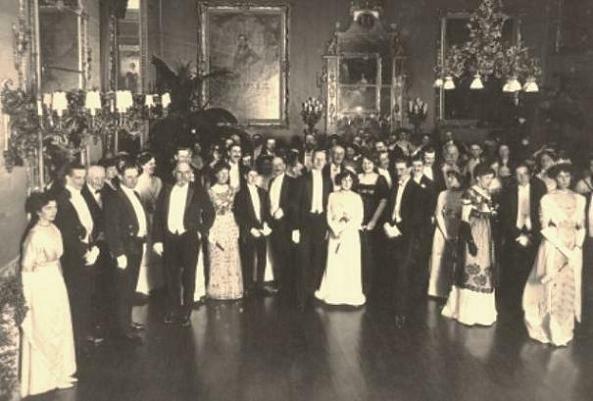 On January 22nd most of the Queen's family had gathered at her bedside at Osborne House. 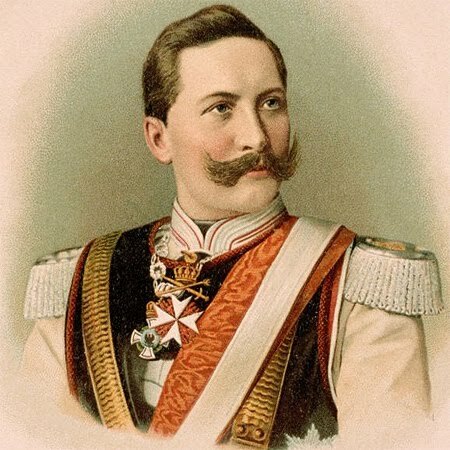 Her eldest grandchild, Kaiser Wilhelm II of Germany had taken possession of the situation by occupying the most important place at his grandmother's side, putting his arm around her neck. Alix was kneeling at the bedside taking the Queen's hand in hers, with Bertie standing by her side. 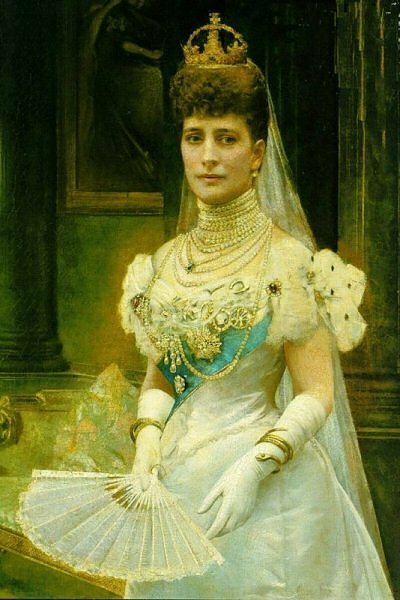 Before dying the Queen pronounced Bertie’s name. She died at 6:30 that evening. 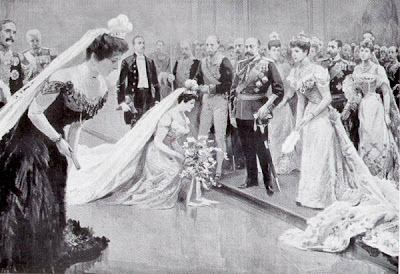 When her small body was to be placed in the coffin, Kaiser Wilhelm tried to lift it, but Bertie stopped him saying that it was the right of the Queen's sons to place their mother into her coffin, so, putting the Kaiser aside, he and his only surviving brother, the Duke of Connaught, lifted the body and placed it into the coffin. The Queen's coffin was taken from Osborne to London on board the Royal yacht Alberta. Bertie noticed that the Royal standard in the yacht was at half-mast; he asked the captain the reason at which the man replied: "The Queen is dead sir". 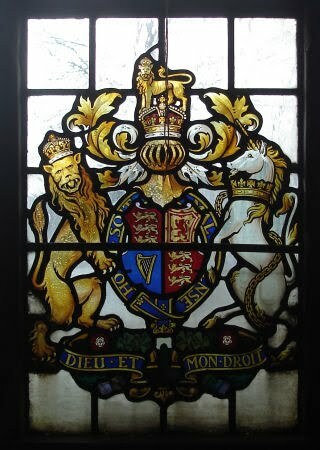 But Bertie firmly declared: "But the King is alive", and the standard was raised. 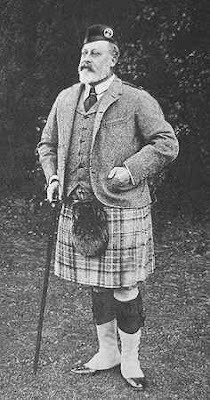 The Victorian Era was over and Bertie was now King Edward VII. On the death of Queen Victoria in 1901 the royal house took the Germanic surname of her consort Prince Albert of Saxe-Coburg-Gotha. 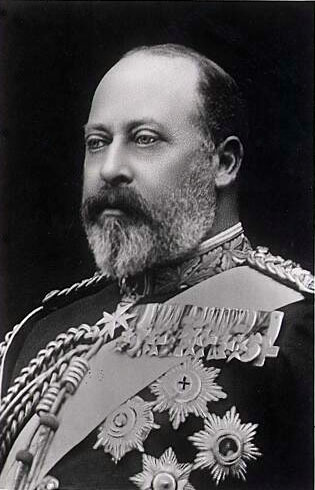 King Edward VII, who reigned until 1910, was to be the only sovereign of that dynasty to reign in Britain. Edward VII, By the Grace of God, of the United Kingdom of Great Britain and Ireland King, Defender of the Faith, Emperor of India. Queen Alexandra clad in golden sheen and sparkling with gem. Clemens with King Edward VII and Queen Alexandra at a Windsor garden party. Dinner parties were held primarily to establish and maintain social connections. 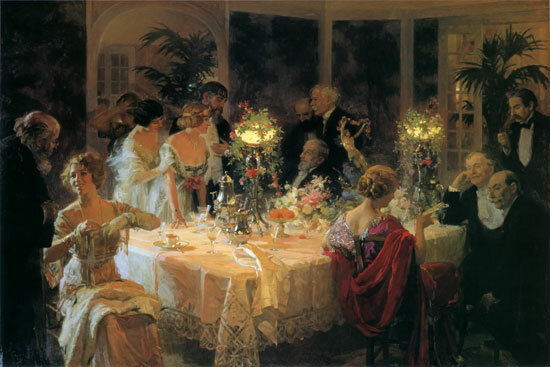 The hostess of a party had 'guest list' of people she considered worthy of her acquaintance: old friends and new friends, people she wished to cultivate for their distinction or wealth, or for the use they might be to her husband. 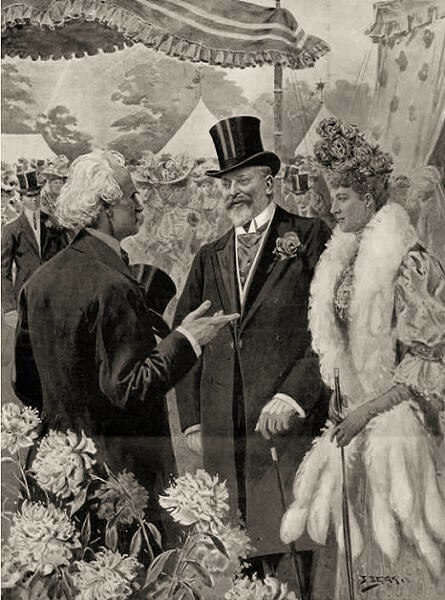 The Edwardian period, which covered Edward's reign and was named after him, coincided with the start of a new century and heralded significant changes in technology and society, including powered flight and the rise of socialism and the Labour movement. 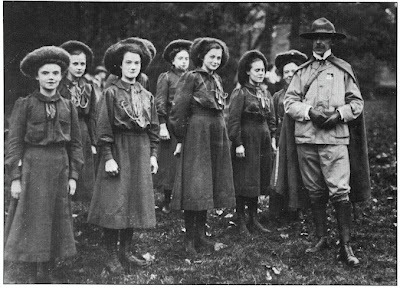 Edward fostered good relations between Great Britain and other European countries, especially France, for which he was popularly called "Peacemaker", but his work was unable to prevent the outbreak of World War I in 1914. 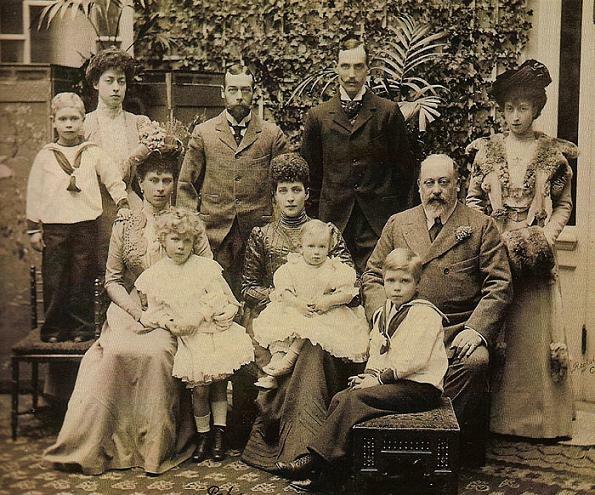 He was the first British monarch of the House of Saxe-Coburg-Gotha, which was renamed by his son, George V, to the House of Windsor. 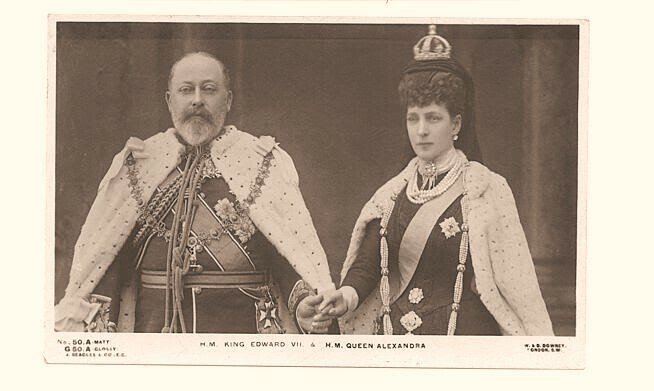 As king, Edward VII proved a greater success than anyone had expected, but he was already an old man and had little time left to fulfill the role. 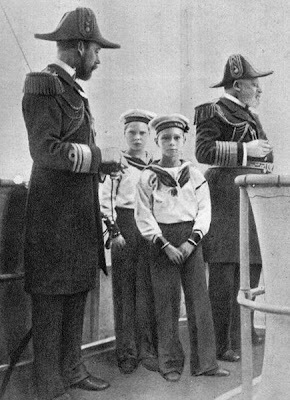 In his short reign, he ensured that his second son and heir, who would become King George V, was better prepared to take the throne. Contemporaries described their relationship as more like affectionate brothers than father and son, and on Edward's death George wrote in his diary that he had lost his "best friend and the best of fathers … I never had a [cross] word with him in my life. I am heart-broken and overwhelmed with grief. Four Kings: King Edward VII (right) with his successors—(from left to right) his son, the future King George V, and grandsons, the future King Edward VIII, and King George VI. 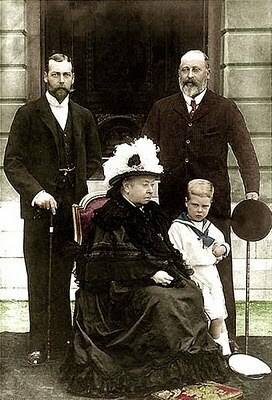 Group picture of Edward VII, Queen Alexandra and family at Sandringham. 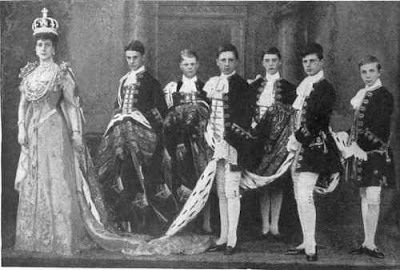 Seated, Mary, Duchess of York, with Prince Edward of York (later Duke of Windsor), Queen Alexandra (with Prince Henry, later Duke of Gloucester) and King Edward VII. The Duke of York, later King George V, is standing behind his mother and wife. 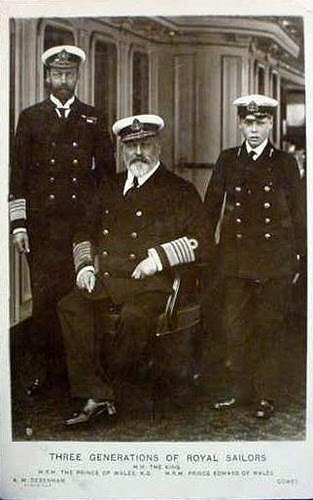 At the end of his life, due to his heavy smoking, King Edward was prone to severe bouts of bronchitis. 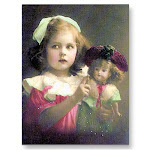 The last persistent bronchial attack occurred in March, 1910, while he was staying at Paris. He returned to London in April and by May it was realized that the King was dying. He arose on Friday, 6th May feeling "wretchedly ill" as the day progressed the King began to drift in and out of consciousness and suffered a series of heart attacks. 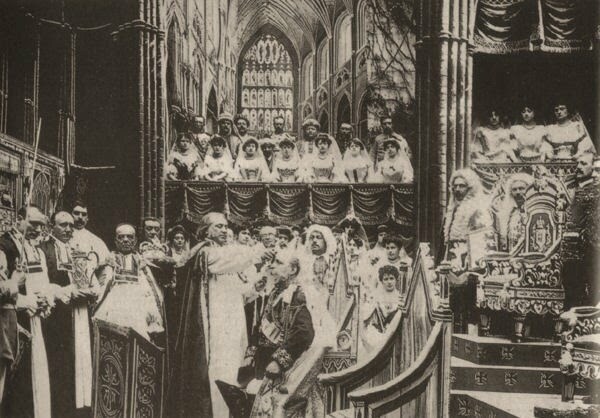 On his deathbed at Buckingham Palace, Edward was heard to mutter "I shall not give in, I shall work to the end." 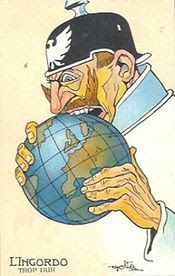 French Propaganda Postcard from the World War I era showing a caricature of Wilhelm II biting into the world. The text reads "The glutton - too hard." 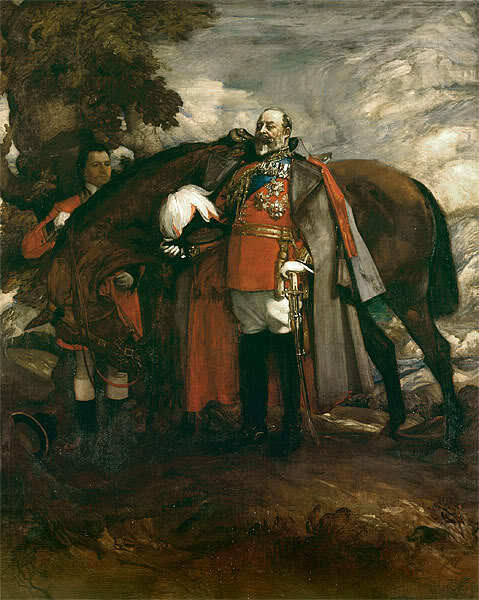 Edward always worried that his nephew, the Kaiser, would tip Europe into war. Four years after his death, World War I broke out. The naval reforms and the Anglo-French alliance he had supported, and the relationships between his extended royal family, were put to the test. - With Edward's death, Wilhelm considered himself the supreme power in Europe. 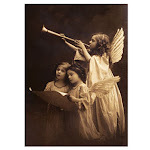 His death brought an end to a time of peace and prosperity, and the war marked the end of the Edwardian way of life. glad you found the post interesting, I have to visit you soon. 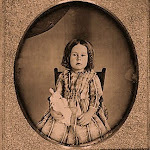 Very interesting post and wonderful photos as usual. 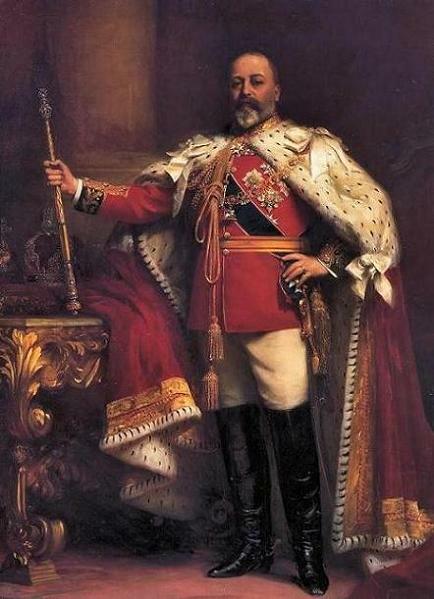 Edward VII, he opened up the Royal Family and condemned it to public gaze. 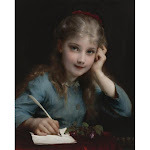 Thank you dear friends for all your comments...With this post I say goodbye to "Bertie" I found him absolutely interesting, although I have to agree with Hermes, he made the Royals more appoachable. So much so, that as a result, they are the stuff soap operas are made of. 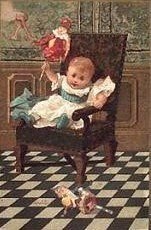 I have never been able to be terribly interested in the royals, but your posts are interesting, so thank you!